The mechanics of the game are introduced after ascertaining that the child is interested and willing to draw. The child is asked if he would like to play a "fun drawing game-the squiggle-drawing game." Aaron, an 11-year-old boy, was in psychotherapy because of compulsive rituals which he used to ward off angry feelings. He was a shy, quiet boy of above-average intelligence who did well in school but had poor peer relations. He appeared to be a good candidate for a drawing game since one of his rituals was drawing detailed maps. The squiggle-drawing game was introduced in the third interview. In the fourth interview, his third drawing (Figure 15-1) was of a "prehistoric animal who survived in a warm valley and finally found a friend of his own kind outside the valley and wasn't sad anymore because he had a friend." This clearly dealt with his peer relationship problem. Beth, an 11 '/2-year-old girl, had been seen in psychotherapy every other week for almost two years because of behavior difficulties, poor school performance despite average intelligence, feelings of insecurity and inadequacy, poor self-image, and poor peer relations. She made good use of projective game techniques including the squiggle-drawing game. Two months before terminating treatment, she was physically in early adolescence without having started her menses. She played the squiggle drawing game and her second drawing (Figure 15-2) was of "Cleopatra riding on her camel and having snakes on her head.. . kings and queens of Egypt have snakes on their head.. . Cleopatra is going to exercise and ride all over the desert." The drawing and thematic material suggested a significant improvement in her self-image through identification with Cleopatra. The role of the therapist in the game is to carry out an empathic, collaborative, interactive psychotherapy focused on the child's problems and stage of development. The therapist is guided by the content and structure of the child's drawings and stories to help the child express his thoughts, feelings, and concerns in displaced, thematic form. The therapist shares through his own drawings and stories his understanding of the child's problems and suggests possible solutions. 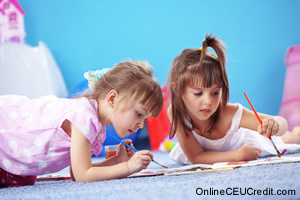 The therapist is not only challenged by this technique, but is helped in the process because the participant child enjoys his own drawing and story-telling as well as the therapist's. The game is truly collaborative and is part of an ego-oriented psychotherapy. - Schaefer, Charles & Donna Cangelosi, Play Therapy Techniques, Jason Aronson Inc.: 1993. The preceding section contained information about the squiggle game. Write three case study examples regarding how you might use the content of this section in your practice. Why was Aaron a good candidate for the squiggle game? Record the letter of the correct answer the CEU Answer Booklet.